What do you get when you combine the thrill of betting on thoroughbred horseracing action with all the excitement of a full-fledged online casino and sports book? The answer is Bovada, one of the premier betting platforms available right now. You can watch and wager on all the major horseracing betting events like the Kentucky Derby, Preakness, Belmont Stakes, and Breeder’s Cup right from the comfort of your living room with a Bovada account. Formerly known as Bodog, Bovada hit the online gambling scene in 2000. It was founded by Canadian Calvin Ayre. Although the primary business venture of Bodog/Bovada has always been online gambling, the company has also been involved in music and television production, MMA, and even coffee sales. The important thing to understand about Bovada is that they have proven themselves to have some staying power and reliability. Bovada has managed to carve out a pretty good reputation for itself in the online gambling industry despite a few setbacks due to the online gambling issues in the United States, and the site is friendly to US players. As its stated mission, Bovada aims to provide a complete gambling experience for its customers by offering a huge menu of gambling opportunities. The avid horseplayer will not be disappointed with the Bovada racebook platform. If a player encounters a problem it is a simple matter to have it quickly resolved by contacting Bovada’s excellent customer service. Simply send an email to [email protected]. We found the response times to customer service requests excellent and the help satisfactory. 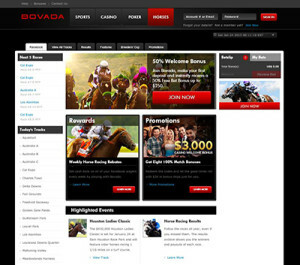 Horseplayers enjoy a variety of benefits when wagering through Bovada. It’s legal in the United States. Unlike many forms of Internet gambling, betting on the horses through Bovada is 100% legal in almost every area of the US. The IP address of a new member is logged at signup to determine their country of origin and we verified Bovada’s US acceptance. Setting up an account is fast and easy. Creating a Bovada account is fast and easy. Just a few simple clicks and you can be betting on the horses in minutes. In our own experience the whole process took less than five minutes from start to finish. No subscription fees. Bovada does not charge any subscription fees for their service. All revenues earned by Bovada come from the takeout of the betting pools just like they do on an actual racetrack. Of course, Bovada also earns money from their online casino. There are no monthly betting minimums, either! Bonuses and rebates on all your horse betting action. Bovada not only offers many generous bonuses to new and existing players (when we last checked some were as high as $3,000!) they also provide a weekly rebate to horseplayers. You will receive a weekly rebate of 3% on all straight wagers (win, place, show) and 5% on all exotic wagers (exacta, trifecta, superfecta, Pick 6). You read that right. At Bovada you receive a portion of every bet you make back, win or lose. Future wagers and propositions. At Bovada you will find bets that many other racebooks don’t offer such as futures and propositions. Do you have a hunch in January which horse might win the Kentucky Derby in May? Bet a future wager and you could cash a big winning ticket on Derby Day if your horse wins. Live races and replays. You will never miss another horserace because you can stream races from every major track in the world on your desktop, laptop, tablet, or phone with your Bovada account. Easy deposits and withdrawals. A variety of deposit options are available at Bovada including the acceptance of major credit cards. Withdrawals are processed quickly and without hassle. Real-time odds. You will receive real-time odds updates, will-pays, and more at Bovada. Mobile betting. Bovada has jumped right into the current craze of mobile betting with its amazing app that is available on both Android and iOS phones and tablets. You can access the full betting menu offered at Bovada with this user-friendly app. Bovada has really made it easy for horseplayers to choose their racebook for their wagering needs. Start betting now at Bovada! The betting menu at Bovada is nothing short of spectacular. 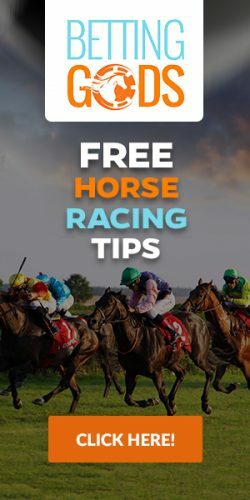 Every bet available at the racetrack can be found at Bovada, and the selection of tracks available for wagering not only includes US venues but tracks in Australia and Canada. Click HERE to visit horses.bovada.lv: US Licensed & Legal online racebook!